Thank you for your interest in volunteering with us. 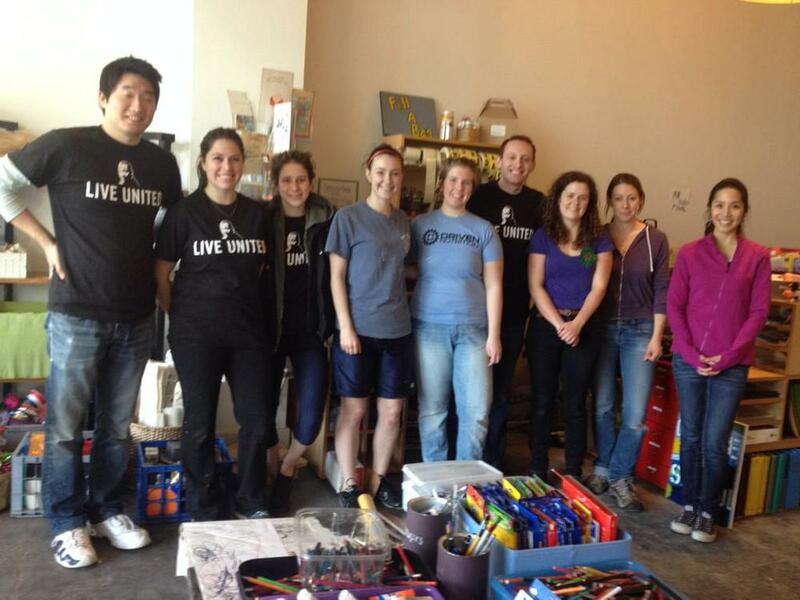 Seattle ReCreative has mobilized over 100 volunteers to keep tons of usable material out of the landfill, create art ed opportunities for kids, teens, and adults, and offer the lowest prices around on art/school/office supplies in our retail store, all while developing nonprofit partnerships, growing by leaps and bounds, and trying to keep up with our busy, buzzing, building creative reuse community. We rely on our amazing volunteers to help our retail and teaching staff make all of these amazing things happen. In return you get 20% off all the goodies you find on your volunteer days, 20% off new memberships (yours + up to 5 gift memberships) monthly work parties, quarterly skill shares and socials, and that warm fuzzy feeling you get when you know you did something wonderful. Weekly Shifter (2-8 hours a week) - Schedule a weekly shift in the retail store during which you can choose from projects in to-do binder, tidy store front, adopt a chore (join rotating staff/VIP volunteer chore chart for housekeeping duties), work on an ongoing project, accept/sort donations, and assist customers. Retail Department Connoisseur (4-20 hours a week) - Head up organization of one section of the store. Work with Operations Assistant to create tasks/projects for volunteer to-do binder. Assist customers, weekly, and drop-in volunteers. Perfect for organized, detail-oriented people. You should be familiar with different levels of value to be able to properly price donations at 1/3 of SRP (with help from the internet), and train other volunteers and staff to to recognize special finds in your department. Good communications skills essential. If you would like to volunteer with us, please email Maria at volunteer@seattlerecreative.org and tell us what level of commitment you are interested in and a brief description of your arts experience. We also have internships available so if you are looking for school credit check out the internship page or Email Jenna at info@seattlerecreative.org to build an experience that is mutually beneficial. If you want to teach a class, dabbler, skill share or offer your creative reuse content to the mix, check out the workshop proposal page.